Various column and pillar remains is all that is left from the historic Theatre Antique in Arles, France in Europe. The detailed architecture of some of the columns and pillars left standing at the Theatre Antique in Arles, France is just an example of how much work was put into these sculptures. The Theatre Antique in Arles originated in the first century and as years have passed the theatre was victim to major destruction.Visitors to the Theatre Antique will find it fascinating as you wander behind the stage and throughout the ancient theatre grounds where there are scattered remains with a historic story behind each one. A tour through the Antique Theatre area in Arles, France is like stepping back into ancient times and discovering what life was like in earlier centuries. 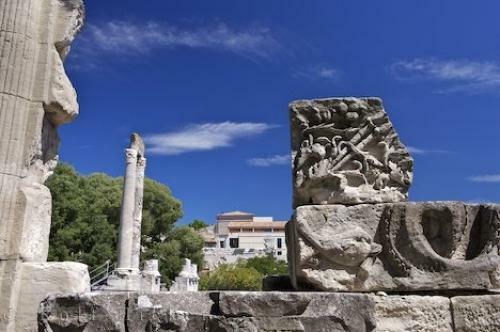 The surrounding area is a magnificent place to spend the day in the lush green grass and have a picnic and enjoy the day in Arles, France.Remains of columns and pillars in the Theatre Antique in the city of Arles, Bouches du Rhone, Provence, France, Europe. Photo of pillars and columns remaining at the Theatre Antique in Arles in the Provence, France in Europe.